We haven't reviewed anything from Chewy in awhile and decided it was time to do something about that. This month the boys tried the Halo Mix'n Mores Dog Food Topper. I chose this specifically because Shiver's not much of an eater anymore these days and I wanted something that would encourage him to consume a few more calories. 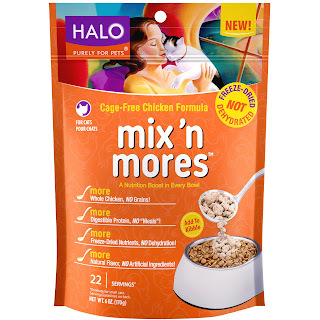 We received a six ounce bag of the chicken formula to try. 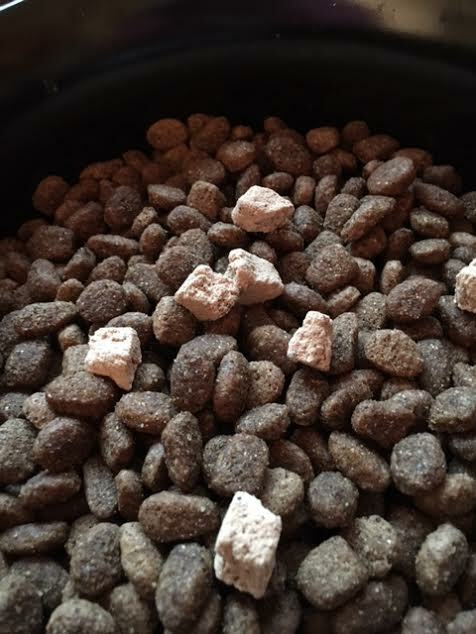 It's a freeze-dried topper that you add to their regular food, whether you feed them wet or dry. The amount given depends on weight, although I didn't follow that. I grabbed a handful and split it between two bowls. The boys absolutely LOVE it!!! 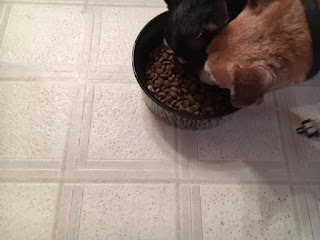 You'd think that I don't ever feed them the way they gobble it down. Shiver tends to be a little finicky when it comes to food. He'll eat something for a few days like it's going out of style and then he's not interested. It's been almost a week and he's still very excited for dinner time now. Chico is just as delighted. Yes, they each had their own bowls. This was a very rare moment when they were willing to share. Tasting good isn't the only reason to feed this to your dogs though. 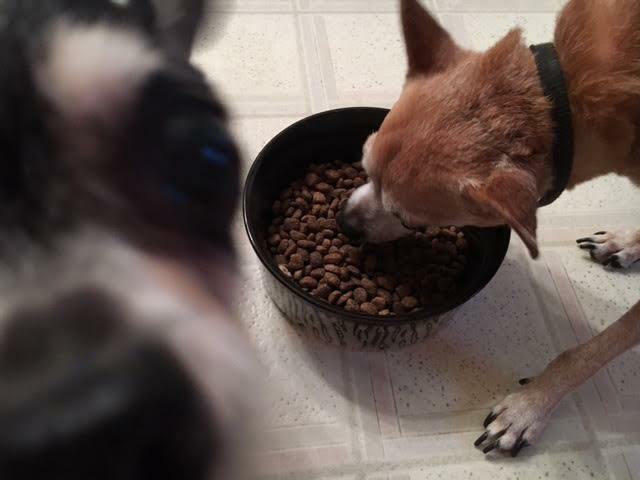 Shiver and Chico give this eight paws up. I'll add in my own two hands because anything that gets Shiver eating again makes me very happy. You did AN EXCELLENT review fur our DEAREST FURENS at CHEWY.Com. We are glad that you liked this foodable. OMD, I LOOOOOVES freeze dried stuffs!!!! That looks amazin'! I can tells you, I would eat it like I haven't eaten in a week if I gots that! I hopes the boys are doin' well, they look good! You knows I am always thinkin' of you guys, and sendin' lots of healin' vibes and POTP and AireZens. What a wonderful review! Loved the pictures! It looks very yummy and Mom and I can tell you pups love it!